The Chico Poker Network has just deployed its take on lottery-style sit-n-gos, called “Windfall Tournaments.” The new game went live sometime around 1:30 p.m. ET on Dec. 14, 2017. It has its own tab in the poker lobby where players can register for up to four games at once. It's present at both U.S.-facing network skins, BetOnline and Sportsbetting.ag, and the ROTW site TigerGaming too. The new games can be played for $3, $7, $15, and $30. Much as at competing sites with similar formats, the Windfall SNGs at Chico start with stacks of 500, blinds at 10/20, and three-minute levels. Once three players register but before the play actually begins, a multiplier is chosen randomly. This number can take one of the following values: 2, 5, 10, 50, 100, and 2,000. The prize pool equals the buyin level times the multiplier, which means that the highest possible payout from Windfall at the $30 level is $60,000 with a 2,000x multiplier. We jumped into a few of these sit & goes to see how they work and gauge the quality of the opposition. Much to our surprise, we found that our opponents were, for the most part, even more inexperienced than is the case at the rest of the already-soft Chico Poker Network tables. 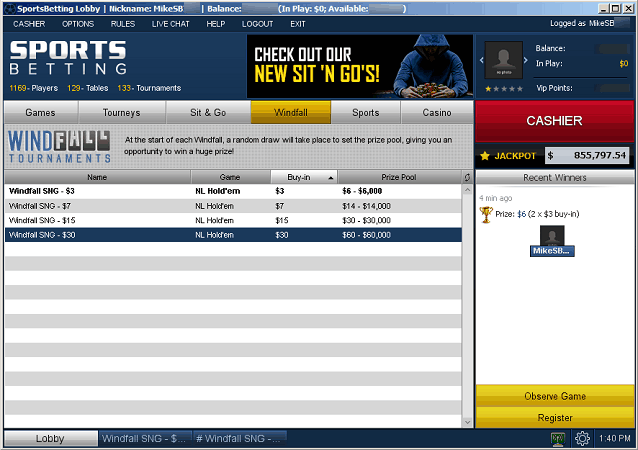 In fact, we think that our staff actually won the first Windfall ever run. Check out the screenshot below where our intrepid writer is listed as the only user in the “Recent Winners” column. The various pay schedules aren't all equally likely to occur. The most common value, 2x, will be selected more than three-quarters of the time. Conversely, the highest 2,000 multiplier will be chosen only once every 100,000 games. The frequency of the highest paytable is exactly the same as the percentages found at the two other U.S.A. online poker sites that have such games: the Winning Poker Network with its Jackpot Poker and the PaiWangLuo Network and its Jackpot Sit & Go. 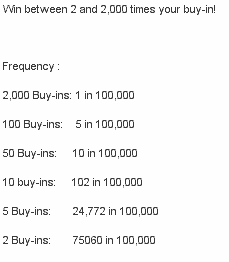 However, the top multiplier at PWL is only 1,200 whereas at WPN, it can be as high as 2,500. Where Chico beats WPN is in the presence of the 5x multiplier, which doesn't exist at the Winning Network and is instead represented by a 4x level. All the Windfall games we've seen were winner-takes-all, but we were not fortunate enough to encounter any multiplier above 5x in our limited sample size. Solid information on this aspect of Windfall isn't present on either the BetOnline or Sportsbetting.ag websites, but it would not surprise us if every player gets paid at the top few pay structures because this is the way it's done at other poker rooms. The inclusion of Windfall within the Chico poker roster is a bit surprising because there's every chance that it will steal traffic away from other SNGs. However, management recently shut down the highest $525-buyin sit-and-gos, and it also removed most of the low-margin, sub-$1 games.The intention was probably to condense the liquidity into fewer possible variants so that once Windfall hit the scene, the more densely populated sit-n-go lobby wouldn't be as drastically impaired as it would have been were the players spread out among thinly trafficked stake levels. The addition of Windfall tournaments allows CPN to catch up to the Winning Poker and PaiWangLuo networks, which are, incidentally, the only two internet poker organizations that accept Americans and have more player traffic than Chico. The three groups have been competing hard in the past year and jockeying for market share. In April 2017, BetOnline and Sportsbetting.ag debuted a mobile poker client, joining the PaiWangLuo Network, which has had mobile poker since May 2014. While the latter network still has yet to incorporate SNGs and MTTs into its poker solution for tablets and phones, the Chico mobile poker platform, which has since gone live at TigerGaming also, has cash games, sit-n-gos, and multi-table tourneys. The Winning Poker Network has recently launched its own mobile software, but it only has Jackpot Poker SNGs and no other forms of poker present. We'd say Chico is in the lead in this department. All three networks have had Bitcoin payments for more than a year, but in April 2017, the Chico Network enabled Litecoin support followed by Ethereum in October. The Winning Poker Network, however, leapfrogged ahead of its rivals by including dozens of crypto coins as payment channels beginning Oct. 11. Ignition/Bovada/Bodog on the PaiWangLuo Network meanwhile started accepting Bitcoin Cash, but it's not really publicizing this decision, and many customers remain unaware of it. We believe that the Winning Network is ahead in altcoin support, but Chico is in a close second place because many of the coins featured in WPN's cashier aren't commonly known or used. As the Chico Poker Network, PaiWangLuo Network, and Winning Poker Network vie for dominance in the American online poker market, one thing's for certain: It's the players who are benefitting. Windfall tournaments will help close the gap between third-place Chico and its rivals. We've even heard whispers that BetOnline, TigerGaming, and Sportsbetting.ag will implement a fast-fold poker upgrade any day now, ending PWL's monopoly in the U.S. poker scene for this popular style of gameplay. If you're eager to try out these new Windfall games, then you can sign up at either BetOnline or Sportsbetting.ag if you live in the United States. If you reside elsewhere, then TigerGaming is the room for you. They all provide an identical 100% up to $2,500 bonus for poker that clears at a 33% rakeback equivalent rate. In addition, you'll be able to enjoy their casino, sports, racing, financials, and other betting products. Read our in-depth Sportsbetting Poker review, TigerGaming poker overview, or BetOnline Poker review for instructions on how to sign up and claim the maximum possible level of rewards. For other sites with lottery SNG products, consult our review of the top lottery-style sit & go poker operators.